This film is sometimes held up (mistakenly, I would say, for reasons I’ll discuss below) in contrast to “The Birth of a Nation,” to argue that D.W. Griffith wasn’t really racist after all, he was simply misunderstood. It is among the movies he directed in his first year at Biograph and it does demonstrate his belief that the movies could be used to tell serious stories with messages. Even though he was to rebel against the short format for movies, is also demonstrates his ability to work effectively within that form. 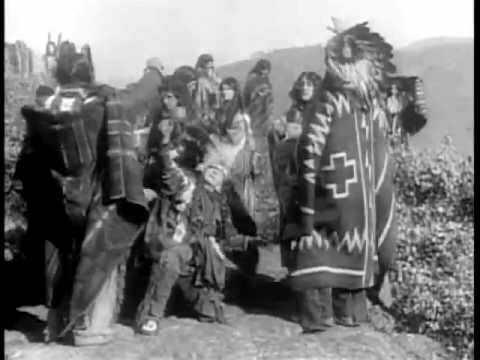 In the beginning of the film, a young Native American couple meets by the riverside. He shyly proposes to her and she shyly accepts (all in pantomime). When they return to their tribe, the young man is faced with a horrible choice between her or his father. A group of plundering white men suddenly arrive and insists that everyone leave the land. He protests that his father is to old and ill to move, and for a moment it looks like there will be a confrontation, but then the white men get ahold of his bride and keep her hostage. Reluctantly, the tribe begins their exodus. Whenever they stop to rest, suddenly the white men are there with guns drawn, telling them to keep moving. The girl tries to take advantage of this to escape, but is recaptured. Finally, the old man dies and a ritual is held to honor him. 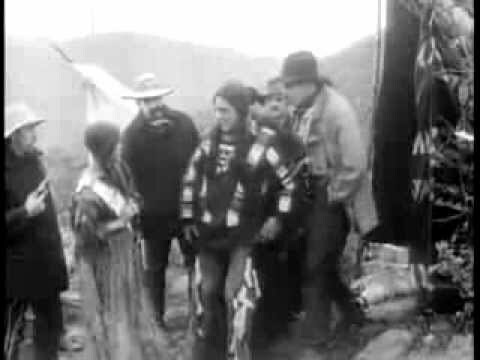 The young man returns to the camp to free his wife, but they are caught again. The white men appear ready to kill them both, but one white man stops the others and sends them on their way. They have lost their land, but they are together. Although Griffith tried hard to make this a powerful experience, there are a couple of flaws in this film. First, our sense of time and place is very ambiguous. We get the impression of a long trek (and even are given to understand that the natives reach the Pacific Ocean), but they never seem to be more than short walking distance from the white men’s camp, which never changes. At times it seems we are seeing simultaneous events cross-edited but then characters from one thread turn up in the other – as when the girl attempts her escape to be caught by the same men who are harassing her husband. The other problem is inherent in trying to make a silent movie about people suffering from walking. 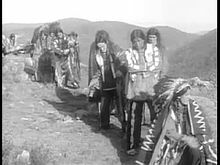 A lot of the movie is just shots of the Native Americans walking slowly across the screen, with sad expressions on their faces. It’d be hard to make this work with dialogue, but without it, it makes 15 minutes seem long. On the plus side, the New Jersey Palisades stand in nicely for the bleak yet unspoiled landscape Griffith wants us to believe of the West. So, doesn’t making a pro-Native American movie clear Griffith of the charge of racism? Well, not exactly, although it does complicate it a bit. This movie is steeped in the imagery of the “Noble Savage,” and the tragic-but-inevitable side of Manifest Destiny. In claiming to give us “The Point of View of the Red Man,” Griffith presumes to speak for numerous cultures, and he lumps them neatly together into a classic stereotype, albeit one less negative than that of “Gus,” the lustful African American. And, of course, he uses only white actors to portray them, although admittedly it would have been hard to find genuine Western Native Americans on 14th Street in New York, let alone good actors of that background. This is generally a less offensive movie than “Birth,” but that doesn’t make it un-biased.